"If science and medicine are so great, then why are so many people dying of cancer?" This question has been asked of me more than a few times. The answer is complex and multifaceted. (1) Most importantly, we are dying of cancer because more of us are living long enough to die of cancer. Thanks to scientific and technological advances, Americans no longer drop dead of diphtheria (which, in 1900, was the #10 cause of death). In 1900, the average American lifespan was a paltry 46.3 years for males and 48.3 years for females. By contrast, in 2010, life expectancy was 76.2 years for men and 81.1 years for women. Of course, as Thaddeus Sim smartly points out on his blog, that doesn't mean that old people didn't exist in 1900. They did. But, a far smaller percentage of Americans made it to old age: Fewer than half of Americans made it to age 60 in 1900, but more than half of Americans made it to age 80 in 2000. "[P]eople between 55 and 84 are increasingly more likely to die from cancer than from heart disease. For those who live beyond that age, the tables reverse, with heart disease gaining the upper hand. But year by year, as more failing hearts can be repaired or replaced, cancer has been slowly closing the gap." (2) We are becoming better at diagnosing cancer. That's not necessarily good news. It is still possible that an early detection will not cause you to live a moment longer. (This is a phenomenon referred to as lead time bias.) But, knowing the cause of death is better than not knowing, and we have become quite good at medical diagnostics. The red line indicates the number of deaths that would have occurred had the mortality rate not fallen to the actual rate (blue line). 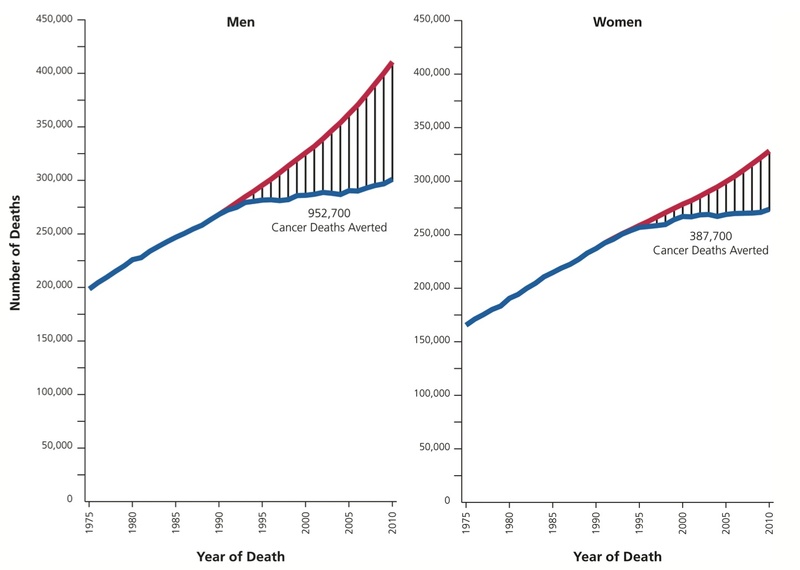 Thus, the drop in the cancer mortality rate saved the lives of 1.3M Americans since 1991. That sounds like another win for science. Cancer, you're on notice. *Note: In 1900, the top three causes of death were due to infectious disease: pneumonia/influenza, tuberculosis, and gastrointestinal infections. By contrast, in 2010, the top three causes of death were heart disease, cancer, and noninfectious respiratory disease. This is yet another triumph of science, particularly microbiology, as my favorite microbiology textbook claims.